Buy through MusicWeb for £41.50/43/44.50 postage paid World-wide. Just what is any potential first-time purchaser of Wagner’s epic Ring cycle, in sound or video, to do? The choice facing them is daunting. I can recall in just the last two to three years, and in no special order: DVDs conducted by Lothar Zagrosek, Bertrand de Billy, Daniel Barenboim and Hartmut Haenchen, as well as CD issues of the Zagrosek (this time on Naxos), Haenchen (confusingly though not the same one as on DVD, but a set taken from the following season), the legendary 1955 Bayreuth cycle under Josef Keilberth, another reissue of a set by Hans Knappertsbusch, and last, and by no means least, the unfolding cycle on Melba, here being considered in its third instalment. What’s more this list is far from exhaustive. Moreover this survey takes no account of the cycles already in existence, directed by such distinguished Wagnerians as Bodansky, Furtwängler, Krauss, Moralt, Böhm, Solti, Karajan, Goodall (in English), Janowski, Sawallisch, Levine and Haitink. Let us assume that despite this plethora of choice you have been seduced by the attractive book-style packaging of the present Melba issue and have taken the plunge. What exactly will be found within the covers? Well, I am bound to say at the beginning that the choice will not have been a bad one. This is a Siegfried which, taken as a whole, measures up well against recent competition …. and that isn’t damning with faint praise. Firstly, perhaps contrary to more usual practice, some words about the orchestral contribution. Asher Fisch may not be an especially familiar name to British audiences, unless you regularly tune in to the Saturday matinee broadcasts from the New York Met, where he has been employed conducting what one might term the “bread-and-butter” operas. If memory serves, I last encountered him conducting “Bohème”. The Ring is undoubtedly a step up from this repertoire and it’s a promotion in general that he handles well. As the opera progressed the comparison which kept coming to mind was with the work of Sir Reginald Goodall. True, although he can be deliberate at times, Fisch is normally not as expansive as his predecessor, but there is nevertheless a similar warmth and care over detail that is reminiscent of his older colleague. Listen for example to the Act 2 prelude where he catches Fafner’s breathing so well in the lower strings, or indeed how well he sets up the atmosphere at the very opening of the opera. With beautifully graded and articulated brass, lower strings and bassoons the orchestra creates a real atmosphere of the dark, forbidding forest of Mime’s cave. Into this he mixes a sense of the malevolent frustrated brooding of the twisted dwarf, and his dreams of wresting power from the awesome presence of the dragon Fafner. Yet in gentler more reflective music, for example the Forest Murmurs in Act 2, he also makes his mark. These are quite beautifully done, with some particularly attractive woodwind playing anticipating the appearance of the Woodbird. However whilst conductor and orchestra are very important in Siegfried, it is an opera after all and not just a gigantic instrumental tone poem. So the question is begged … what about the singers? The obvious inquiry is: how does our eponymous hero fare? Well Gary Rideout is a pretty decent singer although not always to my taste. His reproduction is of a rather “covered” variety that to my ears can sound slightly throttled under pressure … but … and it’s a big but …. he does at least sing the role, and doesn’t bark or screech it. And what’s more he doesn’t seem to tire appreciably; very welcome when he’s pitted in Act 3 against a Brünnhilde who’s spent the first two and a half to three hours in the dressing room! True, from time to time, I also had some doubts about the power and “reach” of his voice. In the Act 1 forging scene, despite Fisch’s care (as elsewhere) over balances, Rideout often seemed to be overwhelmed by the orchestra …. albeit not an uncommon result in live performance. However I have to report that this initial conclusion was drawn listening to the discs on a conventional CD player. Switching to a SACD compatible machine - albeit reproduced only in two channels - the tenor seemed to ride the heavy orchestration more clearly. Indeed there was now more depth of perspective to the sound and a more palpable sense of involvement in a theatrical performance. Conclusion … whilst it’s perfectly acceptable as a CD, try if you can to hear the recording in SACD format (two or multiple channels). There are other characters who dominate the first two acts. Mime, Siegfried’s “father by default” is prominent as is his brother Alberich whose enmity to Mime is marked; earlier in the cycle he foreswears love to obtain the gold from which the Ring is forged. Wotan - here styled as “The Wanderer” - leader of the gods who also craves the Ring, has realised its corruptive powers, and has put in train a series of events - including Siegfried’s birth - to try to restore order. Richard Greager is a most effective Mime, characterising without caricature ….. not always a given with singers in this role. Moreover he does sound sufficiently different from Rideout to prevent the two roles from being confused. Again this is not always guaranteed; in the Levine Ring (Deutsche Grammophon 429 407 2GH4) for instance Rainer Goldberg’s hero really does sound like he could be Heinz Zednik’s son! Alberich meanwhile is in the capable hands of John Wegner. I thought him a little plain in his first exchanges with the Wanderer at the beginning of Act Two, but he quickly gets into his stride. He is particularly effective in his confrontation with Mime in the third scene of Act 2. There the two argue over the gold and Siegfried’s fate in front of the cavern of Niedhole and the dragon’s corpse. Meanwhile Fafner, the slain reptile, is well sung by David Hibbard, who sounds suitably menacing without - it appears - any obvious electronic assistance to the voice. The third and last act of the opera, at least its final sections, inhabits an altogether different sound-world. This is not just because the scene has moved from the foothills and the world of men to the rarefied air of the mountain-tops. 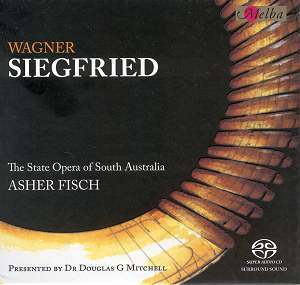 As is well known Wagner broke off more than once from the composition of Siegfried. Act Three was completed after he had brought both Tristan und Isolde and Die Meistersinger to fruition …. and it shows. The harmonic invention evident in the hero’s journey through the magic fire, his discovery of Brünnhilde, her awakening and their subsequent love duet is demonstrably in advance of the earlier part of The Ring. Fortunately, although there are others who eclipse her, the experienced Lisa Gasteen does not let the side down at this point. She proves to be a bride worthy of Siegfried’s efforts. Comparing her performance with her recent appearance on BBC television, as part of the Covent Garden Ring, I felt there were minor pros and cons. Her voice sounded a mite easier and more mellifluous in Australia, whilst her characterisation was a fraction deeper in London but to be honest there wasn’t much to choose between them. Incidentally we meet Brünnhilde (Heil dir Sonne, Heil dir Licht!) just after the side breaks between discs three and four. Act 1 is complete on the first disc, whilst act two occupies the second. Since the timing for Act Three is around 84 minutes it precludes fitting on to one CD. A sensible arrangement. Meanwhile the packaging, as I’ve already suggested, is quite lavish. There’s a good synopsis but there isn’t much background to the score. Whilst Mike Ashman’s essay is interesting, it is aimed more at listeners already familiar with the work. Although it’s welcome to have decent information about the cast and conductor included, a little more context would have helped, especially any impecunious newcomer. The overall sense of the project is one of deserved community and company pride in an enterprise which can stand its ground with pretty much anything elsewhere. I welcome the issue and look forward to encountering Götterdämmerung!